Perhaps it’s because I am half British (my father was born in England and moved here as a lad of four) and I never feel more in tune with those roots as I do when I am sipping tea and nibbling shortbread. Throw in a good Colin Firth movie and, blimey, that’s the cat’s pajamas! Of course ‘nibbling’ might be a tad of a stretch, it’s so rich and delicious, scarfing might be more appropriate. Now what some people don’t know is that shortbread is Scottish, not British. Shortbread is to Scotland what biscotti is to Italy and madeleines are to France. This simple combination of only four ingredients - flour, sugar, butter and salt - lays claim to be the best cookie out there and I tend to agree. If you are bored with the classic recipe, the good news for you is that there are many variations that you can make on the standard. Trendy foodstuffs such as green tea and espresso have made their way into these delightful sweets, updating them for your 2009 Christmas! You can also get creative on your own. Chop up your favorite nuts or dried fruit and add that to the dough. Dust with icing sugar, dip in chocolate, or glaze with icing -- just not all three; you don’t want to mask the shortbread's humble and elegant appeal. Here is a recipe for basic shortbread and following it, some flavoring variations. 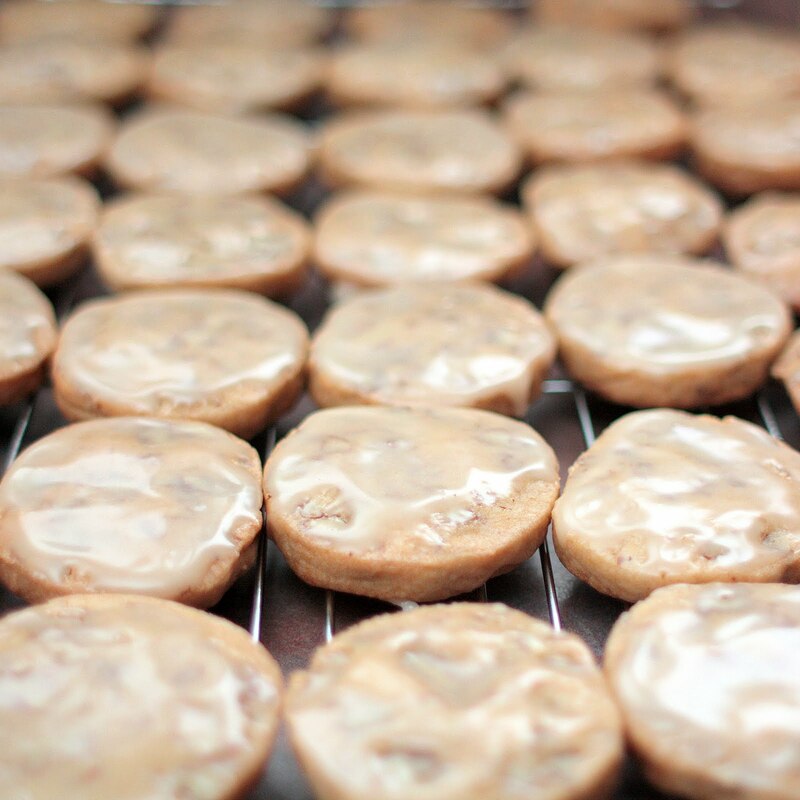 Remember that baking time for each variety will vary depending on the size and shape of the cookies. I am always looking for an excuse to play with my cookie cutters, so I usually roll my shortbread dough and make shaped cookies, but the dough can also be pressed into a pan or rolled into balls and baked. There are almost as many variations in baking shortbread than there are flavorings. Sift together the flour and the salt and set aside. In a bowl or stand mixer, beat butter until creamy. Add sugar and beat another 2 minutes until very light and fluffy. Add flavoring if using. Slowly add flour and mix on low until just combined. Gather into a ball with your hands, wrap in plastic and chill until firm. Place on baking sheet and chill until firm. At this point dough can be well wrapped and frozen for a few months. Bake until firm and just starting to color. Cook on a wire rack. Dried Fruit: Cherries, cranberries, and other dried fruits add wonderful textures and flavor to shortbread. Almond: Add ½ cup powdered almonds and 1 tsp almond extract to the creamed butter. 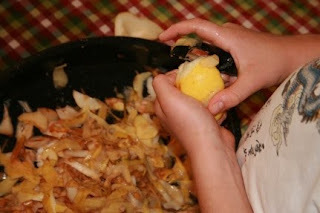 Lemon: Add 2 teaspoons lemon zest and a few drops of lemon extract if desired. Experiment with all types of citrus and don't forget about poppy seeds! Ginger: Substitute brown sugar for the icing sugar in basic recipe. To the flour mixture add 1 tsp ground ginger, 1 tsp ground cinnamon and a pinch of cloves. Green Tea: Sift 2 tablespoons of finely ground green tea with the flour and salt and proceed as usual. Chocolate: Add ½ cup cocoa to the flour and salt and proceed with recipe. dip cooked cookies in dark chocolate for an irresistible double-chocolate cookie. Espresso: Dissolve 2 tablespoons espresso powder in 1 teaspoon hot water. Add to creamed butter and sugar mixture before adding flour. Nuts: Add lightly toasted and chopped hazelnuts, pecans, or (insert your favorite nut variety here) to give a lovely texture and flavor to you shortbread. Herbs: Rosemary is spectacular paired with lemon, as is lavender, so don't rule out the spice & herb cabinet when creating your perfect shortbread. There are some events that go out the window when one is days away from a major move and then there are a select few that cannot be missed. Case in point, I was packing boxes and deep cleaning my pantry during Cupcake Camp Montreal and nary one crumb of cupcake did I taste. A few weeks earlier, however, I managed to organize and host my annual Jam Swap, which I'll share more about later in the post. Stocking the jam pantry must happen, no matter how busy we are. But first, back to the bit about pantry cleaning. I made a serious of discoveries that inspired a mini series on Twitter and while normally I wouldn't bother to discourse about the contents of my pantry as I empty & pack it, I felt there were lessons to be learned along the way. Really, these are pearls of wisdom. ( Hubby's pantry tip) There is no such thing as stale marshmallows. (Or rather "MarshmalLOW", as they ceased to have individual status long ago. Your friends are never going to like those Thai Tom Yum Spiced Peanuts, so stop stocking them & serving them at parties. Nestea? The best before date is 2005. First and last time I'll buy it. Really, do yourself a favor, skip it & make sweet tea from scratch. Items NOT to buy in bulk: tapioca pearls, dried kaffir lime leaves, bran...bulghur. Who am I kidding?? NO ONE eats that much bulghur. Items to stock up on: Whole wheat couscous, Nutella, olives, black fig tapenade, dried cranberries and...jam. Pineapple, Rhubarb and Tonka Bean Jam, Pumpkin-Apple Butter with Vanilla Bean, Plum & Pomegranate Jam, and beloved classics like Strawberry, Black Currant, and Grape Jelly. A 'scone bar' was provided as the vehicle for the jams we tasted; and taste we did - for almost two hours! 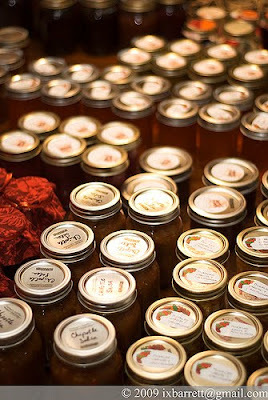 The dining room table groaned under the weight of all the jam jars, but was soon relieved of its burden as the actual swap took only a few minutes. Local bloggers, Ian and Christie of Coco Bean were kind enough to accept my invitation to the swap and let's just say that as soon as I knew Ian was coming, I almost left my camera at home. You'll understand why when you see his shots. He's a very talented photographer and one that I was more than happy to defer the task of documenting the event. As it was, I kept busy enough warming scones, making coffee, cuddling my boys, chatting with guests and tasting jam; my camera was hardly touched all morning. I snapped a few shots, but Ian really captured the event. 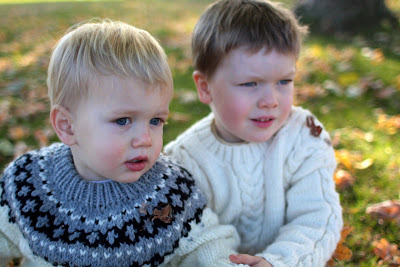 Please visit Coco Bean for a stunning recap of this fall's jam swap. The photos are not to be missed, including a sweet mother-son moment. I'm really not used to being on the other side of the camera! Thanks, Ian! Thanks to all who helped make the swap happen and to all who participated. This could very well be the unofficial start to my holiday baking. Although all future baking is at the mercy of our move and me getting my kitchen set up before Christmas Eve, at least I have a solid cookie recipe to fall back on and a back-up plan for my contribution to that upcoming cookie swap. We're moving in two weeks! Everything is half-packed, boxes line the hallways and fill the corners and the walls are bare. It's an exciting time, despite the stress, and we can't wait to get settled in our little house in the woods. I haven't spilled much about our new place, but I'll informally introduce you once all the craziness of the move is over with. I will say that we feel extremely fortunate to have found a home where we can enjoy the serene country life that we love so much, yet still be relatively close to the perks of the city with it's markets and gourmet shops. We have a little piece of land that we intend to utilize to the maximum, and that may mean tapping those giant maples in the back and getting a few chickens in the spring. Everything in it's season. OK, obviously, I'm excited. 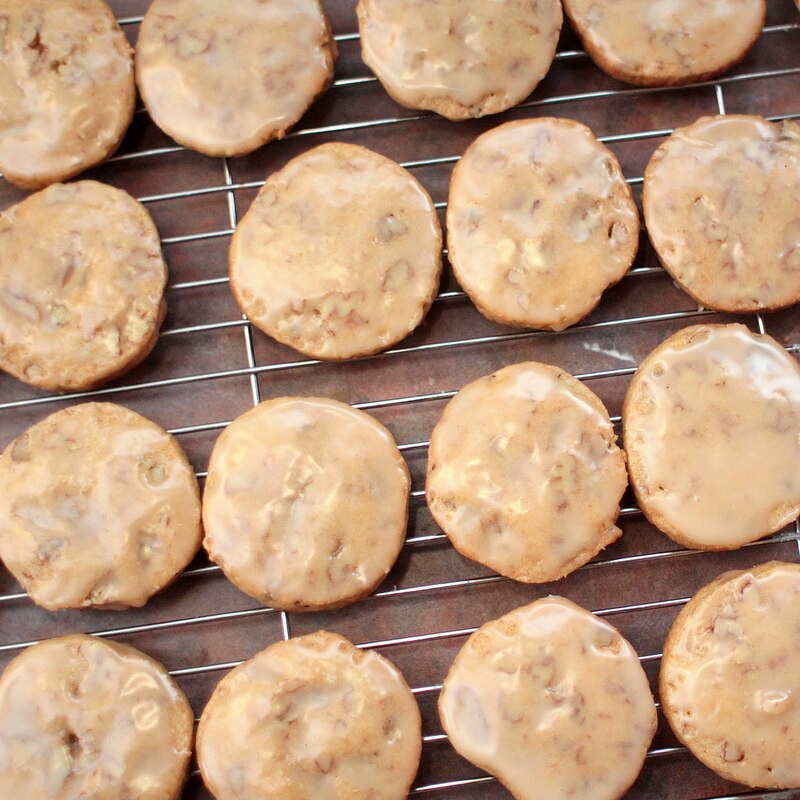 This post was supposed to be about cookies, perfect little maple-pecan cookies with just the right amount of crunch and a decadent maple glaze to dress them up. Pardon me for getting sidetracked; these stellar cookies deserve better. We made these and delivered several dozen to the nurses that took such good care of Mateo when he was in the hospital. I didn't stick around to see if they were a hit, but with so much pure maple syrup inside and on top, what's not to love? Believe it or not, this was my first time to make a slice and bake cookie. I certainly loved the 'make ahead' aspect. My freezer is going to feel naked without a few logs of this Maple-Pecan cookie dough stashed for hard times. I'm going to have to remedy that soon - as soon as I unpack my measuring spoons and cups, that is. Yields about 6 dozen 2-inch cookies. Sift together the flour, salt, and baking soda. In a food processor, pulse the granulated and brown sugars to blend and then add the maple flavouring. Pulse five or six times and then process for 15 seconds. Scrape the bowl to be sure all of the flavouring has been incorporated. In the bowl of a stand mixer fitted with the paddle attachment, cream the butter on medium-low speed until very smooth, about 2 min. Add the sugar mixture in three additions. Mix until lightened in colour, about another 3 min. Add the egg and then the maple syrup and vanilla, mixing just until blended. Scrape the bowl as needed. Reduce the mixer speed to low. Mix in the dry ingredients in three additions, and then add the pecans and mix just until blended. Shape the dough: Have ready three 15-inch sheets of plastic wrap. Portion the dough into three equal pieces and roll each piece back and forth until it forms a log about 10 inches long. (You needn’t flour the rolling surface.) Position each log on a sheet of plastic wrap, centreing it at the edge closest to you. Roll tightly, twisting the ends firmly to seal. 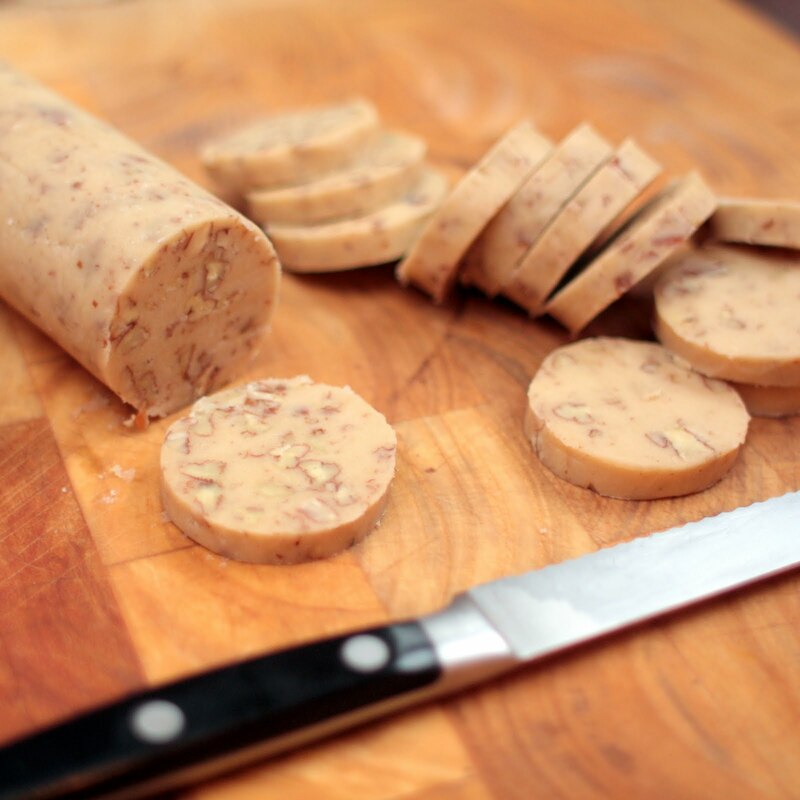 With your hands on either end, push the log firmly toward the centre to compact the dough. The finished log should measure about 9 inches long and about 1-1/2 inches thick. Refrigerate the logs until firm enough to slice, 2 to 3 hours, or freeze for up to three months. Position racks in the upper and lower thirds of the oven. Heat the oven to 350°F. Line two rimmed baking sheets with parchment. Working with one log at a time, use a tomato knife or other small serrated knife to cut the dough into 1/4-inch rounds using a gentle sawing motion. Set the rounds 1 inch apart on the prepared pans and bake until the cookies are lightly browned, about 18 minutes, rotating the pans as needed for even browning. Whisk the confectioners’ sugar and maple syrup until smooth and pourable. Remove the sheets from the oven and let rest on the baking sheets for 2 min. 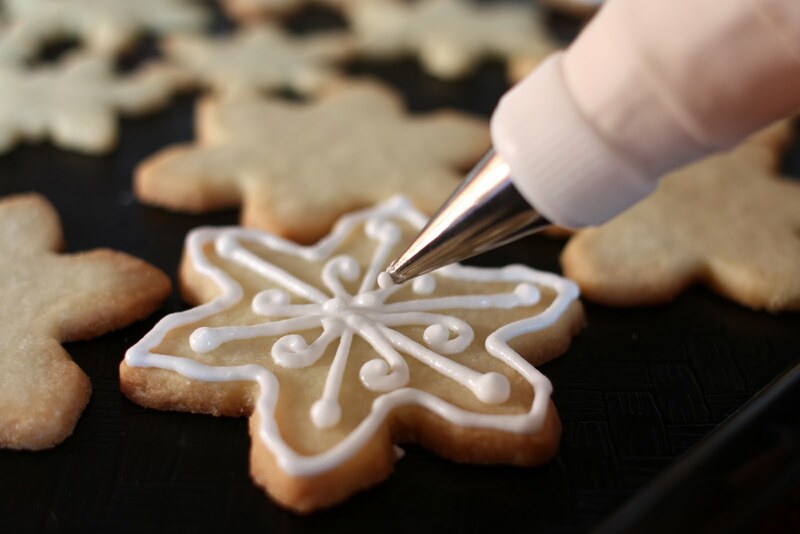 While the cookies are still hot, use a pastry brush to brush a thin layer of the glaze on top of each cookie. 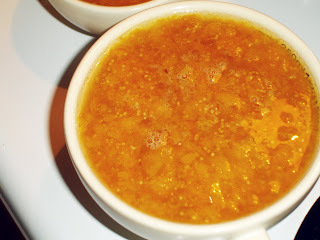 (If the glaze becomes too thick as it stands, thin it with a few drops of hot water.) Transfer the cookies to a rack; the glaze will become firm within minutes. Store the cookies, layered between sheets of waxed paper, in an airtight container for up to a week, or freeze for up to three months. 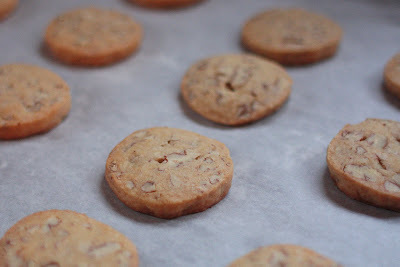 If you're looking for a recipe, I'm over at Simple Mom giving a recipe on How to Host a Memorable Holiday Cookie Swap! We're no stranger to the cookie swap here at Under the High Chair and today I'm dishing my ideas and tips in a simple step-by-step format to help you get the jump on your Christmas baking. I'm a big fan of this social event with a practical side, although with our big move happening in just over two weeks (yikes! ), may have to forgo my annual cookie swap this year. Oh well, good thing I've been invited to one already; I can at least make that happen. On a more personal note, our little family sincerely wants to thank everyone who sent prayers, thoughts and get-well wishes over the last week. Our youngest, Mateo, had major surgery to correct an ongoing medical condition and that was tough on all of us. Although he had been on a waiting list for surgery, it was still a shock to get the call (on a Monday) to say "It's on." (Friday). He made it through just fine with no complications, being the little trooper that he is, and in retrospect the whole ordeal was probably slightly harder on mama! After 3 1/2 days in the hospital, he and I are home and focusing on healing, rest & relaxation. At times like these, it obviously important to pare down one's schedule and focus all attention on the family. Even if it means missing very. exciting. events. such as this one..
Well, I was going to see you there, but, to reiterate what I just stated above, not even the promise of thousands of cupcakes can take me away from my little boy. And you know how much I love cupcakes. 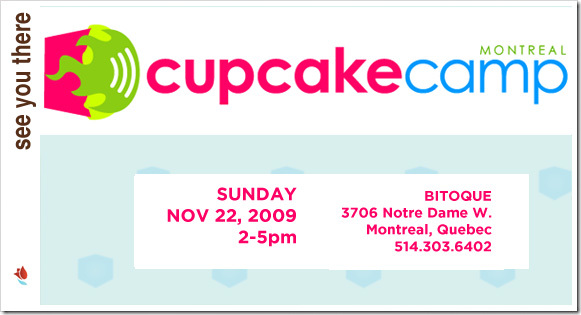 Cupcake Camp Montreal is happening this Sunday!! Proceeds from this one-of-a-kind fundraiser will go towards Kids Help Phone/Jeunesse, J'écoute and massive sugar highs will go to all who attend this sweet event. Do not miss this chance to bake for a good cause! Visit the Cupcake Camp Montreal website to see how you can get involved by contributing cupcakes or follow them on Twitter for regular updates. 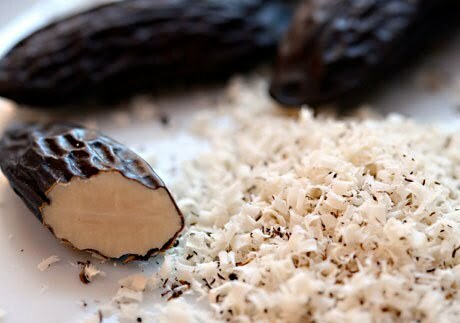 My love affair of the Tonka bean is such that I have been known to ship them to my U.S. food bloggers on more than one occasion. I just can't do with out tonka in my kitchen and feel badly for our neighbors to the south, where tonka beans are banned (yes, they can be toxic if consumed in large doses, but then so can nutmeg). My friend Lydia, from The Perfect Pantry, was the recipient of such a gift recently. As usual, she posted a clear and concise article about the tonka bean and compiled a nice tidy list of recipes. Visit her blog for a little tutorial on this amazing spice, including where to buy it online and featuring my recipe for Spice Snaps with Tonka. 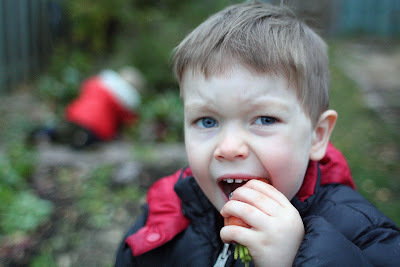 If you've been reading for a while, by now you know that my boys are picky eaters. 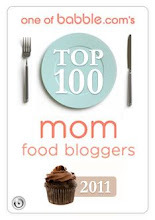 Yep, they rank up there right alongside the most turned-up of noses. 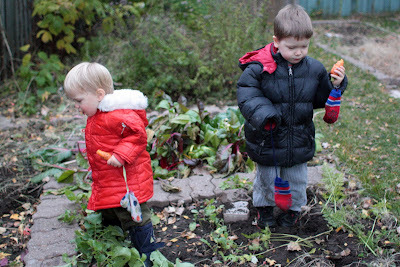 Getting them to eat their greens can be a challenge and so when a vegetable dish makes it past the ever-dubious first glance and that cautious initial bite, it is well worth a mention here. 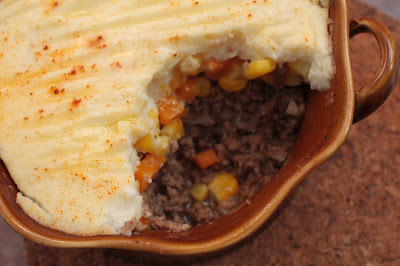 Hence this veggie-laden Shepherd's Pie. The traditional - and beloved by all children - topping of mashed potato I replaced with a fluffy cauliflower puree and no one suspected a thing. Imagine! I wouldn't label myself as a sneaky cook. 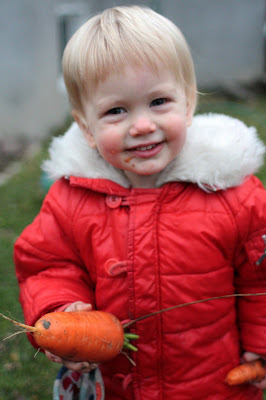 I don't go to great lengths to disguise vegetables, but if it just so happens that I bring healthy ingredients together and give the illusion of something entirely different, I'm going to sit back with a smile on my face and watch the children devour seconds. This past summer we visited a local organic farm and bought a cow - calf-, well, a yearling Black Angus. 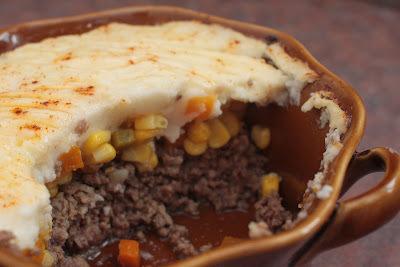 Inspired by a dozen or so beautiful cuts of beef in my freezer, I started the Beef Chronicles as a tribute to the young cow and as an exercise to try new recipes and blog about main dishes more often. Here is the complete introduction to the Chronicles and a more elaborate explanation of the project. Recipes that I have made so far are linked at the bottom of the post. Sauté the onion in the olive oil until softened, about three minutes. Add beef or veal and gently sear the meat all over, breaking up the chunks with a wooden spoon. Add chopped garlic, cumin, oregano, tomato, vinegar and combine well. Cook for ten minutes on medium, stirring often, until evenly browned. Season to taste with salt & pepper. Meanwhile, bring a medium sized pot of water to a boil while you cut the cauliflower into large florets. Season water with salt and blanch cauliflower until quite soft. Drain. Puree cauliflower in a blender until smooth, adding a little cream to assist in the process. Season with salt and pepper and a fine grating of nutmeg. 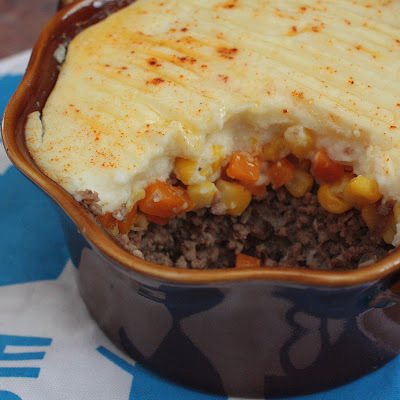 In a casserole dish, spread beef mixture evenly over the bottom. Scatter corn kernels over the meat. Using a flexible spatula, spread cauliflower puree over the top of everything. Smooth to cover. Dust with paprika and bake 30- 40 minutes until heated through. 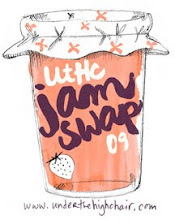 UtHC Virtual Jam Swap '09 Round-up! It is here! The round-up from Under the High Chair's very first Virtual Jam Swap! 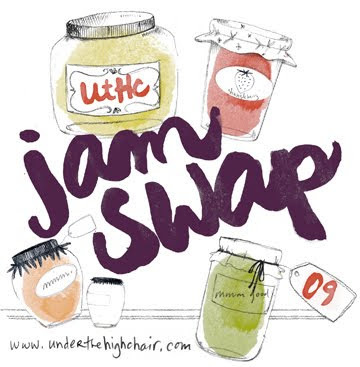 Exactly five months ago I put out the call for you to send me your jam for a friendly virtual jam swap. Not knowing how you would respond, but with the honourable goal to 'inspire and be inspired', I waited for the submissions to come in for my first ever blogging event. Ever so slowly, during the heat of July, they started trickling into my inbox. By autumn and the peak of harvest, I had a nice tidy number of contributions. I finally put a deadline for submissions, which lit a fire under a handful of you, and the last jam was swapped just a few days ago. I was very impressed and thrilled to have twenty-five submissions. 25 scrumptious, sophisticated and stunning submissions. You all should be proud of yourselves, this is one impressive jam party. Thank you, thank you, to each and every one of you who contributed your jam or jelly and took the time to help make this event a success. The talented Cheri from Kitchen Simplicity gets us off to a rip-roaring start with her sophisticated Grapefruit Cranberry Marmalade. 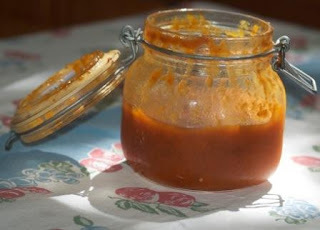 A stunning result from a simple recipe, this marmalade would make wonderful homemade Christmas gifts. 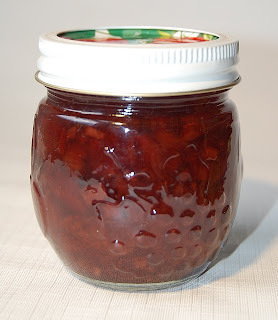 Apple Pie Jam is usually teeth-achingly sweet, but Kim from Flavorista wisely modified the recipe - including doubling the apples - and gave us a yummy Apple Pie Jam no pantry should be without! Those super-gals at Flavorista have been busy! 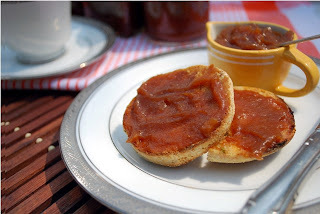 Contributor Tracey submitted this Apricot Jam, a tribute to childhood summers spent canning along side her mother. Cookie Baker Lynn took full advantage of her thriving blueberry patch this summer and jarred up some sophisticated Lemon Blueberry Preserves. 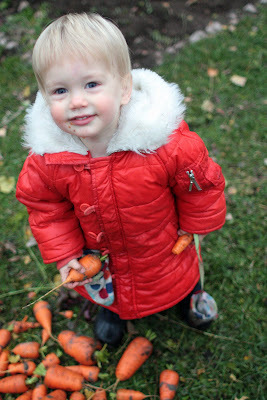 Luckily for her family, they will be enjoying the flavours of summer all winter long. Hulling ground cherries is indeed a labor of love, but I'm sure my fellow Montreal blogger, Candace of Cheese and Olive would agree that it is well worth the effort. Her recipe for Ground Cherry Jam is one I'll be bookmarking, making and swirling into homemade vanilla ice cream next summer. The very creative Cheryl of Backseat Gourmet used a children's book as inspiration for her original Coconut Jam. 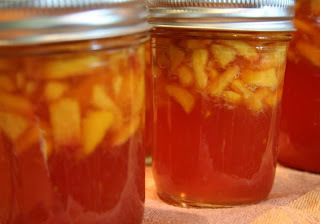 Now this would be the ideal recipe if you got the canning itch during the winter when all the fresh fruit is hard as rocks. My last-minute contribution to this swap was a Quebec Pear and Rhubarb Butter with Honey & Green Cardamom. Fruit butters have been an attractive option for me this year as they are sweetened by the slow-cooked fruit and not by a pile of white sugar. Of all the spreads I've made, this is my favorite! Raise your hand, if you've experienced a jam malfunction! Fortunately, the lovely Melanie from Beck and Call has worked out all the kinks for us in her recipe for Spiced Plum Jam. The addition of fragrant cloves and cinnamon makes it sound all Christmas-y. Sounds like a great gift idea to me. 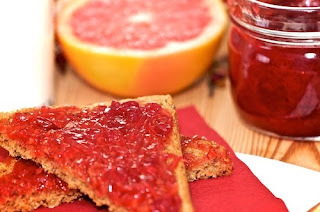 If you've been searching for a low-sugar, no commercial pectin jam recipe, Robin from Hippo Flambé delivers with her tempting Traditional Strawberry Jam with Cointreau & Drambuie. Thanks, Robin! I'll have mine drizzled over vanilla ice cream, please. 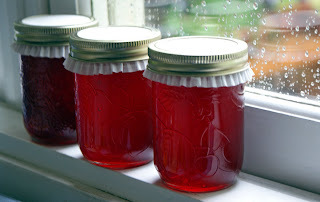 I sighed with envy and my mouth puckered (in a good way) reading about Julie's Nanking Cherry Jelly; don't ask me why, but it seems so romantic to have a cherry tree in your backyard. The ever-industrious author of Dinner with Julie wasn't about to let hers go to waste and the cherries went from tree to table before the birds even had a chance to eat them. Following in her mother's jam-making footsteps, Michele from Chocolate Teapot recreated a favorite jam, Peach and Apricot, and learned a lot along the way. Sounds like you are on your way to a long and happy life of making jam, Michele! Lisa from Feeding My Curiosity is a girl after my own heart. Not only did she use the. most. adorable. jars ever, she also incorporated my favorite vice into her recipe for Red Pepper Jam with Tequila. 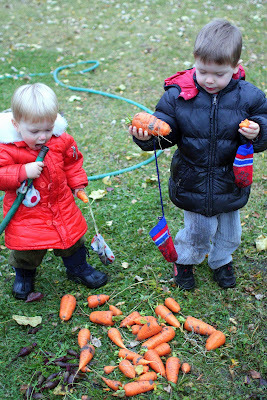 (hint: it's not the peppers). Thanks to Flavorista contributor Barr for giving me a use for ALL my mint! 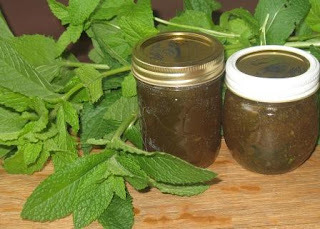 Every summer my mint patch takes over, but now I can help keep it in check by making Barr's Mint Jelly. Now I just need a side of lamb for my freezer! I like to think that I'm not the only one who eats jam with a spoon. I mean, it certainly looks like Kelsey, a.k.a The Naptime Chef, has been dipping into her gorgeous Eternal Summer Apricot Jam--and has nearly finished the jar! I certainly wouldn't have been able to stop at just one bite. If her vibrant photo doesn't grab your attention first, Rumahama's amazing recipe for Peach Brandy Jam will make you sit up and take notice. 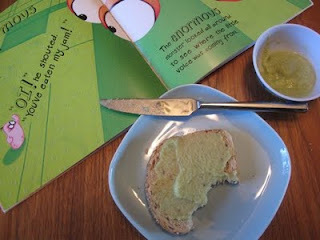 I'm loving this combination and have to agree with Ruhama when she muses about having to get into a toast habit. 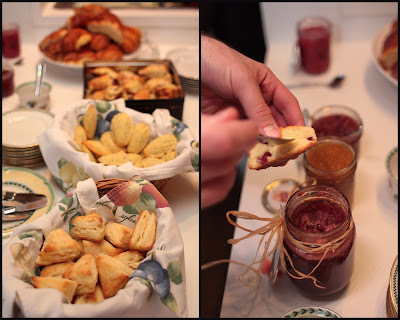 Attempting to multitask while making jam for the first time may be not such a hot idea, as budding gourmet and green blogger Andrea of A.O.K (Okay with Andrea) recently discovered. Her Raspberry-Apple Jam recipe sounds delish, but did it make the cut? You'll have to read about her misadventures to find out. Hey, there's even a free wine tip! Now I haven't tried my hand at making marmalade yet, but Cathy's mouth-watering Three Citrus Marmalade and reassuring step-by-step instructions leave me with no excuse not to. It's obvious this author of Bread Making with The Bread Experience knows her way around canning as well as bread baking. 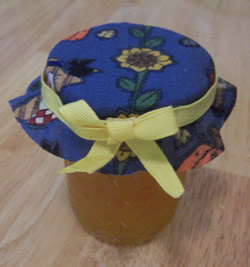 She sure can dress up a jam jar, too! 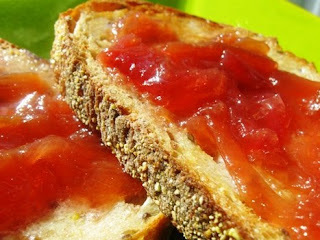 Don't you just love the flavour combination of this Plum Cinnamon Jam? Maria of Two Peas and Their Pod used her own backyard plums for this vibrant freezer jam. Now I'd love to try a plum-cinnamon fruit leather... Maria? By the looks of things, Kimberly made a good move when she captured the essence of spring with this Rhubarb Jam. 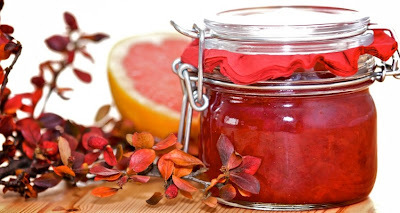 Her clear step-by-step instructions over at Flavorista had me salivating and I've vowed to turn more rhubarb into jam next spring instead of using it up in my usual steady diet of crisps and crumbles. 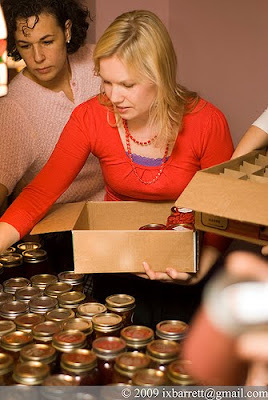 Gabrielle from Shop Wise Bags Innovative Gourmet rounded up the kids and went on a canning marathon. 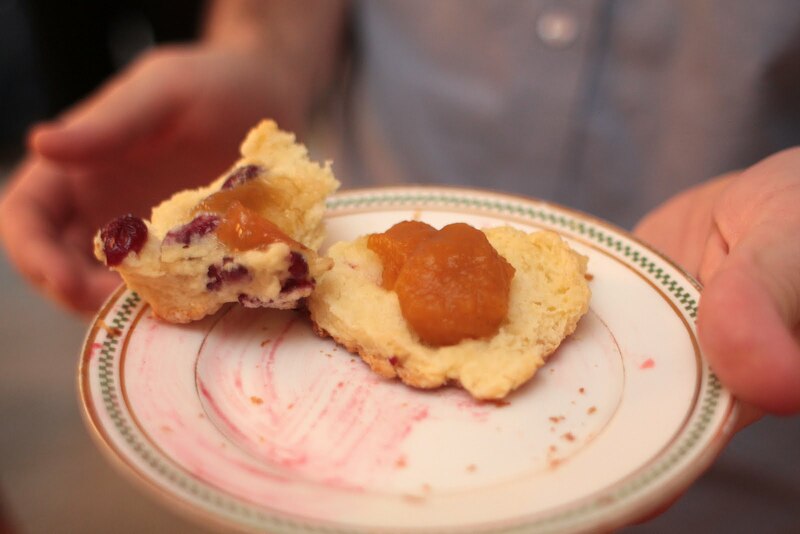 Among the bounty was Peach Raspberry Marmalade or 'Killer Jam' as it was nicknamed. Sounds killer good to me, Gabrielle! Way to get those kiddos in the kitchen. Culinary Travels Of A Kitchen Goddess author George's first autumnal preserve of the season was an apple and plum jelly which she named Early Autumn Blush. It gained its name because the jelly is a gorgeous pale rose colour, which reminded her of the pale red blush hue of the apples. Just gorgeous, George! I would love to request a tutorial from Simona of Briciole, as she sounds like she has the fine details of jam making down pat. The colours alone on her Conserva di Frutta (fruit preserves) are stunning; I can only imagine how colourful they are on the palate. Elizabeth from Guilty Kitchen doesn't seem like your Jane-average canning woman and the Not yo Mama's Apple Butter she submitted is sick --in the most awesome of ways. 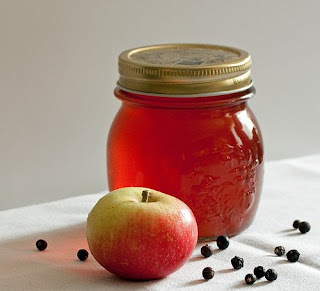 I'm loving this recipe and will definitely be trying it before apple season is over. 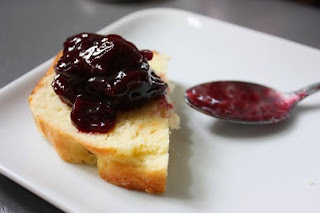 My mouth watered at this dark and seductive Bing Cherry Jam from fellow Montreal blogger, Elaine of A Series of Kitchen Experiments. 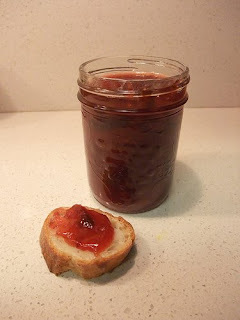 Elaine & friends gobbled up this jam so fast there was none left to bring to my actual swap! That's OK, it looks so good, we understand how it disappeared so quickly! Kelly from No Empty Chairs showed us that a healthy choice can be great with her Low-Sugar Peach Butter. 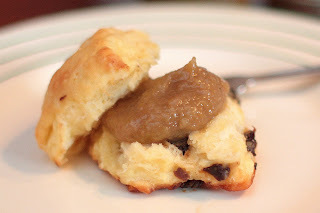 I'm ALL about the fruit butters, and this decadent recipe is on my short list for next summer. That's it!! Have you been inspired? Please share your feedback, encouragement or questions in the comments section below. I'd LOVE to hear what you think....and if this is an event you would like to see happen again next year. I've got this crazy idea in my head that I am going to attempt to can my way though this round-up next summer. Wouldn't that be something? 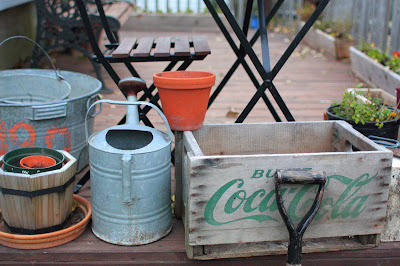 I'd have to give up gardening, that's for sure.